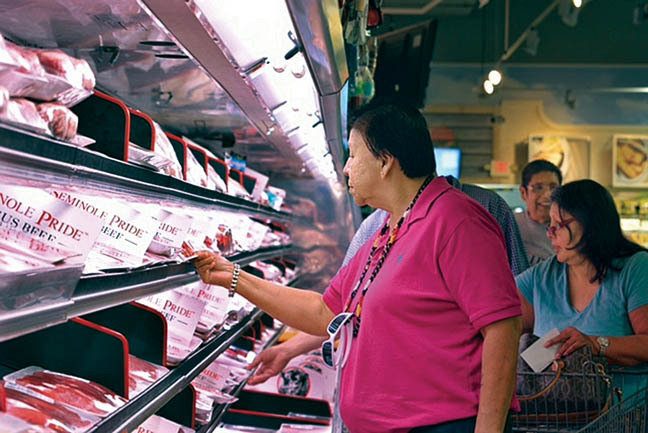 Farm to fork: Seminole Beef hits Broward grocery store shelves | Seminole Tribe of Florida, Inc.
Alice Tucker peruses Seminole Pride Beef at the first retail outlet for the meat, Broward Meat and Fish Co. in North Lauderdale. She went to the grocery store July 29 with President Mitchell Cypress, Hollywood Board Rep. Steve Osceola and a group of Hollywood seniors. For the first time, Seminole Pride Beef is available for purchase at two retail grocery stores in Broward County. The meat debuted in April at the Broward Meat and Fish Co. supermarkets in North Lauderdale and Lauderdale Lakes. President Mitchell Cypress, Hollywood Board Rep. Steve Osceola and a group of Hollywood seniors toured the North Lauderdale store July 29 to witness the milestone. Many in the group purchased meat and raved about it afterward. Since its introduction, the store has placed increasingly larger orders to meet demand. The first orders placed were between 200 to 400 pounds; now the store orders between 5,000 to 6,000 pounds per week. Customers can find a variety of cuts, including inside rounds, peeled knuckles, back ribs, outside round flats, top blades, chuck tenders, oxtail and a Brazilian cut called picanha steak. Selling meat to customers starts in the pastures. Natural Resource Director Alex Johns shepherds the product from farm to fork; he aims to expand the Seminole Pride Beef program to later supply larger retailers. “Right now we are high quality but low volume,” said Board Chief Financial Officer Mike Ulizio. Johns’ five-year plan to build the business includes creating a cooperative program with other Florida ranchers to supplement Seminole cattle. To offer beef year-round, Johns said the program needs cattle to be born throughout the year. The Tribe’s cattle are typically birthed during a 100-day window; co-op ranchers will supply cattle for the remainder of the year to ultimately ensure a steady stock of beef. Johns said he expects the program to provide about 1.4 million pounds of beef from October 2015 to October 2016. Seminole cattle will account for about 20 percent of the product. Johns aims to increase production of the cattle to 100,000 head, which accounts for 10 percent of all Florida cattle shipped out of state for finishing and slaughtering. Through the co-op, the Tribe will have the right of first refusal for all carcasses. Premiums and discounts will be awarded based on the grade of the cattle. Prime, choice and select are the highest grades awarded by the U.S. Department of Agriculture. The quality of most producers’ beef is usually about 40 percent choice and 60 percent select. Seminole Beef averages 66 percent choice, Ulizio said. Seminole Pride Beef is also part of the Florida Department of Agriculture and Consumer Services’ Fresh From Florida program, which promotes local products and provides incentives to restaurants who use them. Johns, who also serves as second vice president of the Florida Cattlemen’s Association, sat on the committee that set the standards for beef in the program. The criteria match Seminole standards. “We set the bar for all the producers to meet,” Big Cypress Board Rep. Joe Frank said. An increase in cattle production statewide could impact other industries. For instance, said Hollywood Board Rep. Steve Osceola, more corn farmers will be needed to grow food for cattle. Farmers near the Quincy feedlot have already started to grow corn. Rep. Osceola hopes to build a legacy program for Florida. “The wheels are turning and the Seminoles are a big part of the story,” Rep. Osceola said. Seminole Pride Beef has been served in restaurants since 2014 via the large-scale Cheney Brothers distribution network. Additionally, as awareness of the brand grows, restaurant customers want to know where they can buy the product to enjoy at home, said Luis Acevedo, Board senior analyst. Acevedo believes that sharing the Tribe’s cattle history will help command a luxury price that customers will be willing to pay. The fact that the product is locally grown, traceable and part of the Fresh From Florida program should also add to the brand’s status, he said. To reach the retail market the Tribe conducted a vigorous grassroots awareness campaign by supporting various organizations that included the Farm Credit organizations, Florida Cattlemen’s Association, Jr. Florida Cattlemen’s Association and Women in the Outdoors. They also sponsored a farm-to-fork tour for hospitality food and beverage directors, chefs and retailers. The first retail deal began through word of mouth. Del Rosario Distribution, a distributor that targets smaller ethnic grocery stores, heard about Seminole Beef. Del Rosario then introduced the brand to Broward Meat and Fish, which liked the quality and presentation of the product. The store stocked it soon afterward. Broward Meat and Fish Co.’s two locations are 3388 N. State Road 7, Lauderdale Lakes, and 8040 W. McNab, North Lauderdale. For more information, visit www.BrowardMeatAndFish.com.